Sikhs should be allowed to wear their ceremonial daggers - known as Kirpans - to school and other public places, Britain's first Asian judge has said. 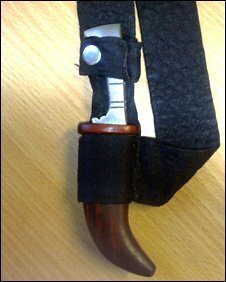 There have been a number of cases of Sikhs being refused entry to venues because they wear the Kirpan or other religious artefacts. Sir Mota Singh QC, who is retired, has criticised schools over the issue. "Not allowing someone who is baptised to wear a Kirpan is not right," Sir Mota told BBC Asian Network. Last year, a Sikh police officer, who had been told to remove his turban during riot training, won a discrimination case against Greater Manchester Police. A schoolboy was also banned from wearing his Kirpan at the Compton School in Barnet, north London. And, in 2008, 14-year-old Sarika Singh won a High Court case against her school after it excluded her for breaking its "no jewellery" rule for wearing a Kara (steel bangle), which is another symbol of Sikh faith. The school was found guilty of indirect discrimination under race relations and equality laws. "I see no objection to a young Sikh girl or boy, who's been baptised, being allowed to wear their Kirpan if that's what they want to do," said Sir Mota, who received a knighthood in the 2010 New Year Honours list. "I wear my Kirpan and I've always worn it for the last 35 to 40 years, even when I was sitting in court or visiting public buildings, including Buckingham Palace." Sir Mota, who is now retired, added: "I think these are issues that can be dealt with with a certain amount of sensitivity. "The girl not allowed to wear the Kara is a petty thing for the administrators to have done and it doesn't do them any good. "It is the right of every young girl and boy to be educated at the school of their choice. For him or her to be refused admission on that sort of ground, as far as I'm concerned, is quite wrong. "It ought not to happen but it does. I think it's wrong to be discriminated against for that reason." The Compton School offered the boy the option of wearing a smaller knife, welded into a metal sheath, but his parents refused and withdrew him - an action by the family that Sir Mota said he supported. He later told BBC Radio 4's Today programme: "But on the other hand, I am also conscious of the health and safety position. "I accept that, because I think as one realises the increase in crimes of violence involving the use of knives and other offensive weapons, I can see that. "But there has been no reported case, certainly none that I know of, of a Sikh using a knife in order to cause injury." Asked about the possibility of substituting a smaller knife in place of the traditional Kirpan, the judge said that might be an option for debate between school and Sikh authorities. But he told Today: "It's a little more than ceremonial. It's a requirement of the religion." In Sikhism, the Kirpan and Kara are two of the five "articles of faith" that must be carried at all times by baptised Sikhs. The others are Kesh (unshorn hair), Kara, Kanga (comb) and Kacha (special underwear). The Kirpan is carried in a sheath attached to a cloth belt. It is normally worn discreetly under clothes and most people would be unaware that a person was carrying one. Guidelines from the department for Children, Schools and Families indicate it is up to individual governing bodies to make their own policy on the carrying of the Kirpan, and if challenged, it would then be up to the courts. Dabinderjit Singh is an adviser to the Sikh Federation UK and he says he regularly receives calls from worried Sikh parents whose children have been prevented from wearing the Kirpan at school and in public areas. Although Sikhs carrying the Kirpan are exempt from prosecution under the offensive weapons act, Mr Singh believes objections about the ceremonial dagger have increased following the September 11 attacks and instances of knife crime. "There have been problems for Sikhs going to tourist attractions," he explained. "Part of it is education. "We're actually working with the government to introduce a code of practice which would then be used to educate people in the security industry so they are aware of the different articles of faith," Mr Singh told the BBC Asian Network. 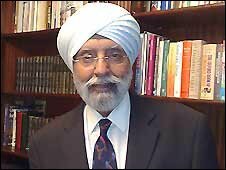 Campaign groups such as United Sikhs and the Sikh Federation UK have welcomed Sir Mota's comments over issues which the judge himself has not had to encounter during his career. Sir Mota was raised in Nairobi, Kenya, before coming to England in 1954 in order complete his studies in law. He joined the English bar in 1967 and made headlines with his appointment to the bench in 1982 when he wore a white turban in court instead of a wig. "The fact that I'm a Sikh matters more to me than anything else," he said. "If, for instance, when I was appointed the suggestion had been made that I could not appear unless I wore a wig and discarded my turban, I would have refused. "I would have said I would not accept the appointment, but the question never arose and no judicial eyebrows were raised at all." You can hear more at 1230 and 1800 GMT on the BBC's Asian Network Reports radio show or via the BBC iPlayer.